BDE Manufacturing Technologies provides rapid prototype machining services to diverse industrial clients across the US. Typically, rapid machining services are employed when custom-made parts are required in small quantities. 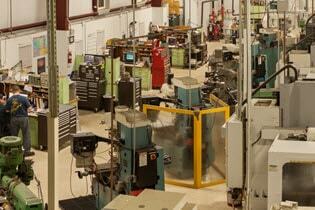 We assure high-quality parts and fastest turnaround times in the industry. Our following rapid machining services allow us to keep committed to deadlines. • CNC Milling: We employ quick turn CNC milling process to create custom prototypes, as well as quality end-use production parts. We utilize 3-, 4-, and-5 axis machining process, and manufacture parts in strict tolerances. • CNC Turning: We utilize a live tooling, as well as CNC lathe to produce radial and axial holes, slots, flats, grooves, etc. Our turning capabilities have helped us provide comprehensive and accurate solutions to an array of industries. • Precision CNC Machining Services: We provide a wide range of precision CNC machining services in short lead times. Some of these include thread milling, external threading, contour turning, countersinking and counterboring, etc. Our advanced CNC machining capabilities enable us to provide one to several hundred parts easily. All rapid prototype machined parts are inspected, packed, and shipped immediately after the manufacturing. • Quick turn Services Guaranteed: Our CNC machines enable super-speed production. These machines have excellent tool changer capacities and are equipped with spindles offering 15,000 RPM. Hence, our technical advantage combined with our vast industry experience, allows us to deliver parts in as little as 1 to 3 business days. • No Limitations on Materials and Designs: We work with a broad range of materials, and can work with any complex parts. We know how to transform complex geometrical designs to full working parts easily. Our wide experiences with diverse shapes, sizes, and materials have helped us grow into a one-stop shop for all industrial prototype building requirements. • Proactive Approach to Parts Optimization: We combine our vast subtractive manufacturing experience with our state-of-the-art manufacturing processes to create quality prototypes. Our experts always suggest designs that help our clients cut down manufacturing costs without compromising on the quality. We help our clients to have an easy transition to production. We work with various types of materials, including metals, multiple types of thermoplastics, elastomers, etc. We help customers to select the right type of material on the basis of their application requirements. Our experts have an in-depth understanding of mechanical properties, and cosmetic appearance of these materials, which enable them to provide appropriate suggestions to clients. Several times, suggestions are also made on the basis of manufacturability characteristics. We are committed to delivering you quality components that your project deserves. For more information on our rapid prototype machining services, contact us today. Or Request a Quote to receive competitive pricing. Please mention the expected delivery time. This will help us serve you the best.